It has been a little over a month since my last Share the Love Saturdays post, which is absolutely crazy! Come on friends! I know a lot of you have blogs that you'd like my readers to learn about, so if you'd like to be featured in next week's share the love saturdays post, read this post to know how to enter! So this week I have one blog to share with you guys! It's Olivia from Olivia Foster. Let me just say holy cow! 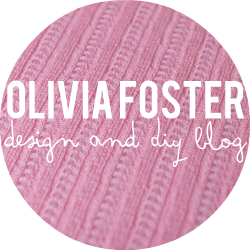 She is freakin amazing at blog design and all that stuff! I am so impressed with her blog and I am literally amazed at how a person can self-teach themselves all that! I asked Olivia to write a few things about herself so that you all can get to know her better and this is what she wrote, "Hello, I'm Olivia. I'm 13 years old from London and I blog about graphic design/blog design as well as DIY's. I am self-taught and I just learn everything myself. You should most definitely check out my blog if you want easy graphic design/blog design tips as well as simple DIY's!" So I really hope that you check out Olivia's blog because she deserves a billion follows and it's really amazing! If you'd like to be featured next week, please send me your info! This is such a cool series! Great idea! !